I first read Think and Grow Rich 13 years ago and the fundamental concepts of the book have stuck with me all these years simply because i believe there's a lot of truth in them. The terrific infograph by Cliconomics neatly summarizes the 13 principles outlined in the book that you can use to achieve terrific success with - the same principles many successful men and women have used before you. Distilling the essence of the book - if you have a burning desire to achieve something, confidence that it can be achieved and the willingness to work at it, you can achieve great things! So just which of the 13 steps are the most important? Napoleon Hill didn't list them in order of importance but in my opinion, here are the 3 most important principles if you want to achieve your dream. Once you've identified your goal, you must be in love with it so much that you're willing to sacrifice whatever it takes to achieve it. It is going to take hours, days, months and even years of hard work to achieve anything noteworthy and when times get tough, sacrifices will be needed to be made on your part. This might include missing out on movies or dinners with friends and family, staying up late and going on without much sleep, or even some monetary sacrifice. But if you love your goal and see that it's worth it, this will make the sacrifices easier to make and will also help you persevere when you face a roadblock. Forming a mastermind involves assembling a team or network who will help you achieve your goals. Individually, we can only do so much but when we combine our imagination, creativity and efforts together, we can achieve much more! I've noticed that when starting a business, if you were to do it all alone, it gets very tiring and it doesn't leave for much room to pursue growth opportunities. Very soon, often at the first roadblock, the business stumbles and then starts to stagnate. On the other hand, if you have a matermind, you're tapping on the knowledge and network of your group. By leveraging the collective wisdom and contacts, it is easier to achieve that initial success that will sustain your motivation to achieve greater things going forward. 1+1 is truly greater than 2. Achieving our goals is often never straight-forward. There'll be challenges and setbacks but it is how we respond to them that determines our success. The book highlights the story of Abraham Lincoln, the 16th President of the United States of America. If nothing else, Abraham Lincoln's story is that of a serial failure - he failed in business, he failed to get into law school, he failed in his first attempt to get into congress, and he was defeated when seeking the nomination for Vice President. Yet he never gave up, he persevered and kept going forward, eventually becoming one of the greatest Presidents in the history of the United States of America. From J.K. Rowling to Walt Disney, Oprah Winfrey to Akio Morita, many who have achieved great success have had to be persistent in the face of failure and lack of progress before achieving their success. There is no reason you can't have the life you dream of living. The 13 steps highlighted in Think and Grow Rich provide a framework by which you can achieve your goals. But make no mistake about it, it will require a lot of hard work on your part but if you truly believe your goal can be achieved, work hard at it and persevere, i am confident that you can achieve your dreams! Stay focused, stay positive! 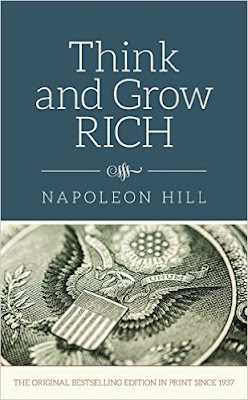 In full disclosure, there are affiliate links to the Think and Grow Rich book at Amazon in the article above. We'd like to thank, you, the reader, for your support in helping to keep the site running all these years.